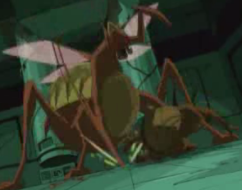 The Giant Wasp Queen is the gigantic queen of the Giant Wasps in the dimension of giant insects. She appeared in the episode April’s Artifact where she was beaten by April. She also later appeared in the episode The Trouble with Augie. Like the rest of her species she seems to be similar to Earth’s Wasps and Hornets, albeit thousands of times bigger! Like the rest of her species she can be harmed by her own stinger, since she re-appeared in The Trouble with Augie after Leonardo attacked her with her stinger she could have been replaced by another queen or only briefly been out of commission. If someone or something disturbed her nest she would attack it, this is what happened to the Turtles and April and also, ironically, to the Brotherhood.